Panini has announced that they've landed a license with the MLBPA to produce baseball cards featuring major league players. Their first set under the deal comes in December with 2011 Elite Extra Edition Baseball with 2011 Contenders Baseball following. This deal provides some legitimate competition in the baseball card market as Topps has been the only company producing licensed cards for the past couple of seasons. Topps still holds the exclusive trading card rights to the MLB license, which means that Panini will not be able to use team uniforms or logos. But in gaining the MLBPA license, the Texas-based company will be able to produce cards of major league players. 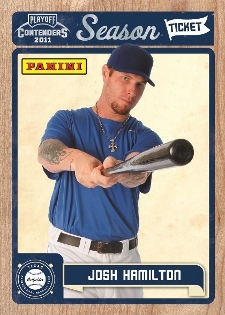 Josh Hamilton will be used heavily in the marketing of the cards. The reigning American League MVP will be featured on packaging and in autograph card programs. Expect further news later today following a press conference featuring representatives from Panini, the MLBPA and Hamilton.